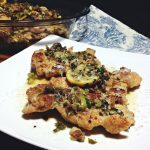 Bring out the best tastes of summer with this easy Lemon Chicken with Capers served alongside creamy fresh Polenta dressed up with grilled Artichoke Hearts and Blistered Tomatoes! In other words, ‘living’ involves breaking routine, and being momentarily uncomfortable in the challenge presented by the new, the strange, and the unfamiliar. The reason is simple and is one that we’ve all experienced, so much so that it’s embedded into our psychology as a species. Things that are familiar and comfortable cease to amaze and stimulate, and without stimulation, without the excitement of trials and challenge, we simply wither. That said, last week I made plans with my brother to have him over for a pre-Father’s Day dinner and I decided to try my hand at that aforementioned polenta recipe for the occasion, but I decided I would be putting a slight ‘summery’ twist on it. 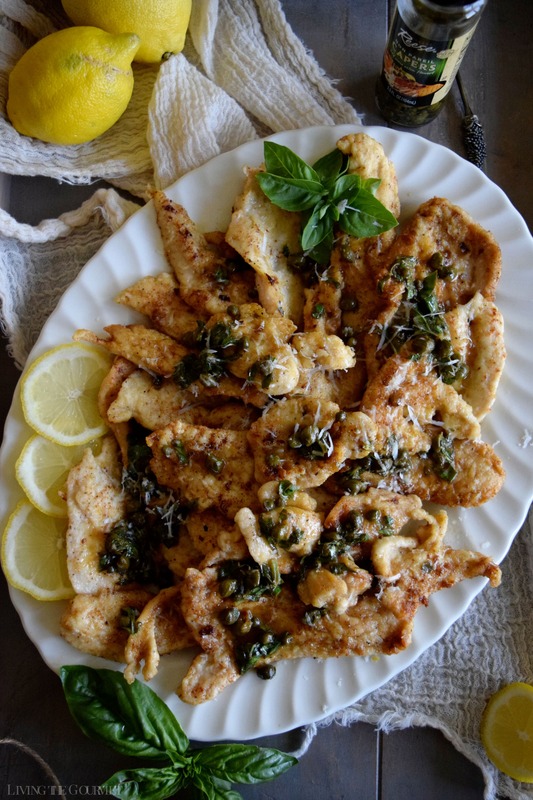 Naturally, that brings us to today’s recipes – Sautéed Chicken Breast with Lemon and Capers, paired with a Fresh Polenta with Grilled Tomatoes and Artichoke Hearts. To start things off, we begin by thinly slicing about two pounds of boneless chicken breast. After that, combine flour, salt, and ground black pepper in a shallow bowl, and dredge the chicken slices in this mixture, setting them aside on a platter as you do so. After that, heat a large cast-iron frying pan with some olive oil and butter, and then place the chicken in the pan a few pieces at time, let them achieve a rich golden color on each side. Each piece should cook roughly three minutes per side, but this can change depending on the thickness of the chicken – the thicker the slice the longer they’ll need to cook. 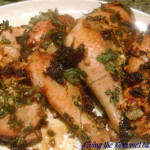 Once the chicken is finished cooking, plate it as shown below, and it’s time to begin the sauce. To start, add lemon juice to the pan, and bring that to a mild heat, and then scrape up the browned bits with a spatula. Add a bit of butter and olive oil, and let that heat. Then add in capers, caper juice, and season with salt, freshly ground black pepper, and some red pepper flakes. For this recipe, I do prefer to use Reese Capers as they’re exceptionally flavorful and versatile. 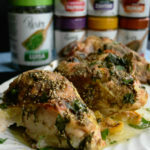 Then add in the fresh basil, toss lightly, and pour the resulting sauce over the chicken, and top that with a dusting of grated Romano cheese and freshly ground black pepper. ¼ stick of unsalted butter – about 4 tbs. Place the flour in a shallow bowl and season it with salt, fresh ground black pepper and red pepper flakes. 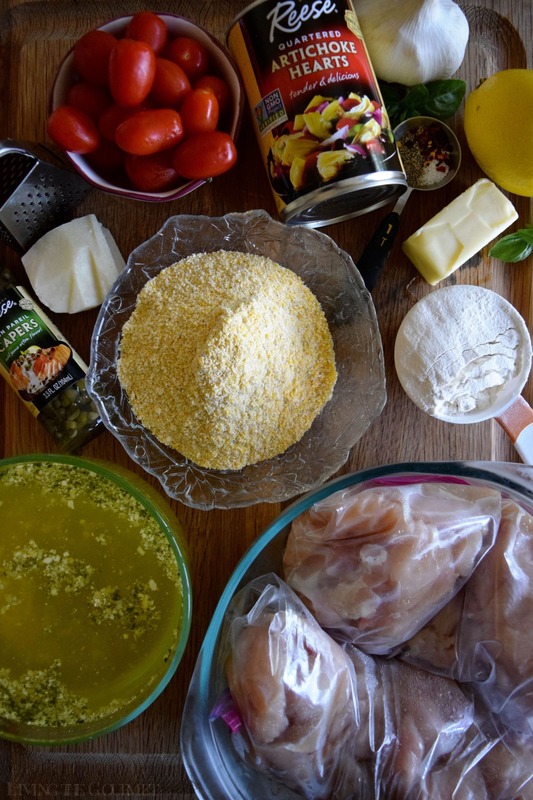 Dredge the chicken in the flour and place on a platter. Heat a large cast-iron frying pan with 2 – 3 tbs. 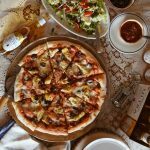 of olive oil and 2 – 3 tbs. of butter. Place a few pieces of the chicken in the pan and allow the chicken to become a beautiful golden on one side, then turn over and finish cooking on the other side, until the chicken is cooked through and the juices run clear, about 3 minutes per side depending on the thickness of the slices. Place on a platter and loosely cover with tin foil to keep warm while you finish cooking the rest of the chicken. When all of the chicken is finished cooking, plate on a platter and prepare the sauce. Add the lemon juice to the pan and gently heat. Scrap the browned bits with a spatula. Add two to three tbs. of butter to the pan and a drizzle of olive oil. 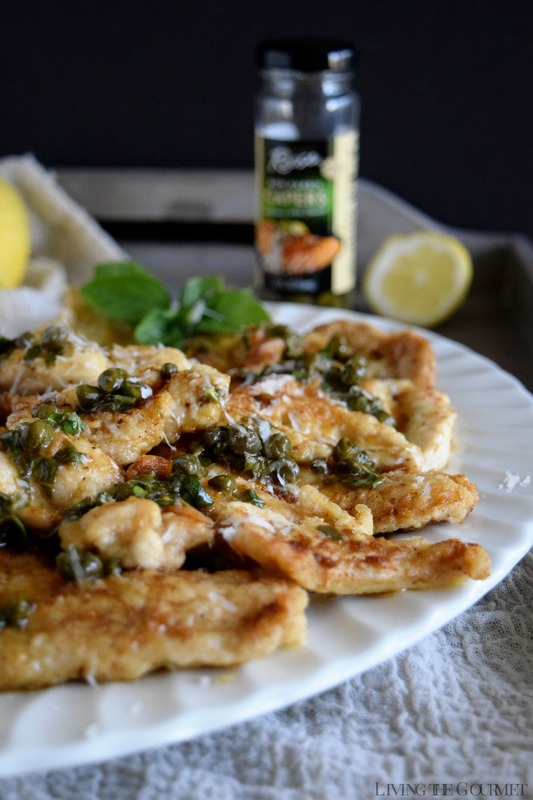 Add the capers, caper juice and season with salt, black pepper and a dash of red pepper flakes. Add the chopped fresh basil and toss. 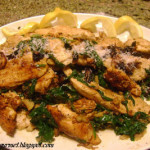 Pour the sauce over the chicken and top with fresh grated Romano cheese and fresh ground black pepper. Heat a cast iron frying pan with 3 tbs. butter and 2 tbs. olive oil; add the cherry tomatoes and the artichoke hearts. 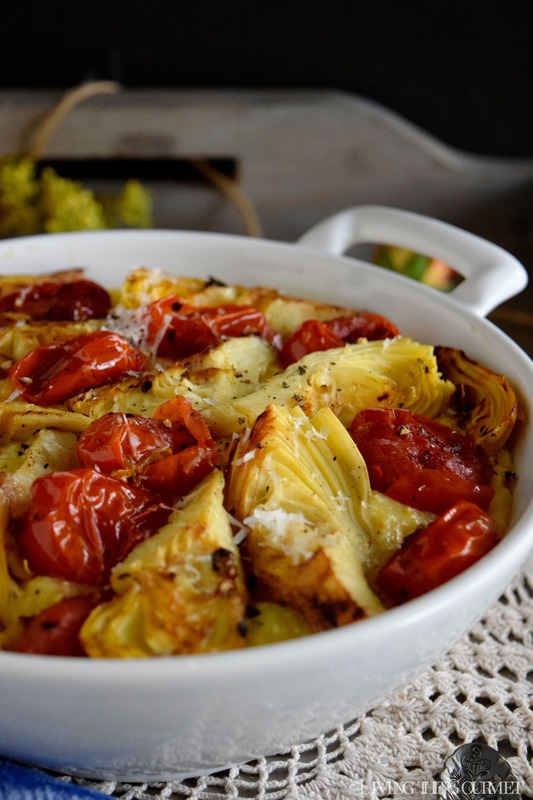 Grill until a nice golden color appears on the artichoke hearts and the tomatoes are slightly charred. Gently crush the tomatoes a bit. Turn the heat off and leave in the pan until the polenta is ready. In a heavy sauce pan heat 3 tbs. olive oil. Add the garlic and sauté until the garlic is fragrant. Add the chicken broth and bring the broth to a gentle boil. Gradually whisk in polenta; whisk constantly until mixture is smooth and begins to thicken. Reduce heat to medium-low and cook until tender and thickened but still creamy, stirring often, about 30 minutes. Stir in ¼ cup of butter and grated cheese. Season to taste with salt, fresh ground black pepper and red pepper flakes. 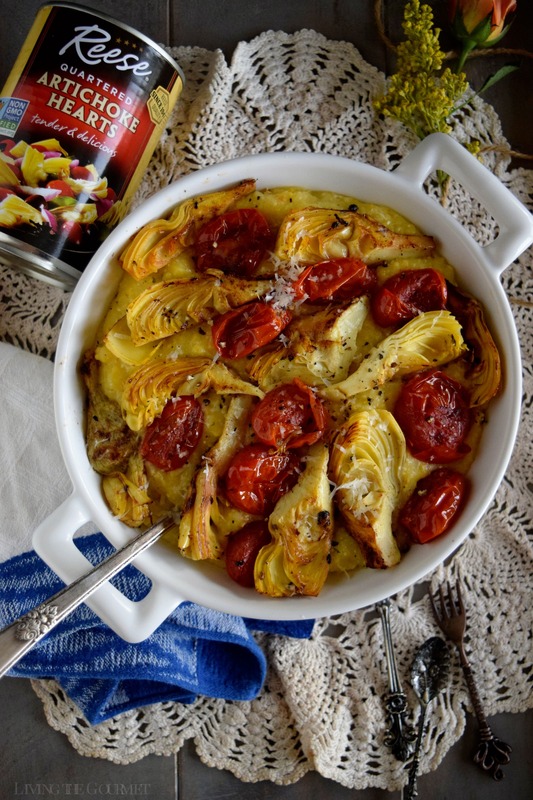 Place the polenta in a serving bowl and top with the grilled tomatoes and artichoke hearts. Grate Romano cheese over the top and extra fresh ground black pepper. To start, heat a large cast iron frying pan with a bit of butter and olive oil, and add in a pint of tomatoes and Reese Artichoke Hearts. Here again, my go-to brand for this recipe is Reese thanks to their reliable quality and flavor. 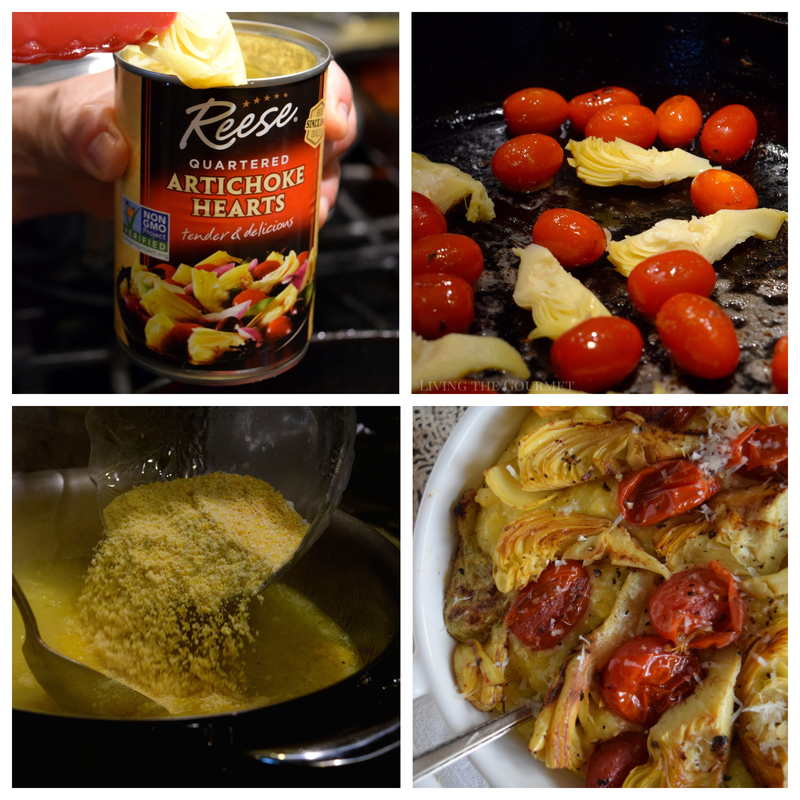 Allow the artichoke hearts to get a nice golden color, and by that point the tomatoes should be slightly charred. Now, once the tomatoes are charred, gently crush them with a spoon, and then turn off the heat leave this aside until the polenta itself is ready. In a separate, heavy sauce pan…can you guess by now? If you guessed ‘heat with oil,’ you’re spot on. Then add in garlic and sauté until the garlic is fragrant. Add chicken broth to this, and let it come to a slight boil. Now, slowly add in the polenta, whisking briskly as you do. In the pictures, well, you’ll notice I didn’t quite follow my own advice and used a spoon instead. Trust me, use the whisk. Once you’ve whisked in all of the polenta, reduce the heat to medium, and continue cooking for about thirty minutes, stirring often but not continuously. You want the polenta to thicken, but to still be creamy. At the end of this process, add in about a quarter of the cup of butter, lemon juice and a copious amount of grated cheese, and season to your preference with salt, ground black pepper, and red pepper flakes. Then scoop the polenta into a serving bowl, and top with the artichoke hearts and tomatoes as shown below and give the finished product a final dusting of grated Roman cheese and fresh black ground black pepper. And just like that, I Stepped out of My Comfort Food, and had prepared a delicious summer dinner. Don’t forget to use your Ibotta app to save on Reese products when you try Reese Artichokes, Hearts of Palm, Capers, and Horseradish at your local supermarket. Also Reese Specialty Foods is hosting a Summer Sweepstakes – don’t forget to enter for your chance to win a Kitchenaid Mixer and other great prizes! So very very yummy! Had some artichoke hearts in my salad today too. Can't wait to try this! I'm actually baking artichoke dip as I type this and had to jump online to find more artichoke recipes because I love them so much! This entire recipe is PERFECTION! Can't wait to try it! This chicken looks like it has SO MUCH flavor! I love the golden brown color. Can't wait to make this recipe! Oh wow..such a feast. I love artichokes but I hate cleaning them so I always have a can in the pantry. 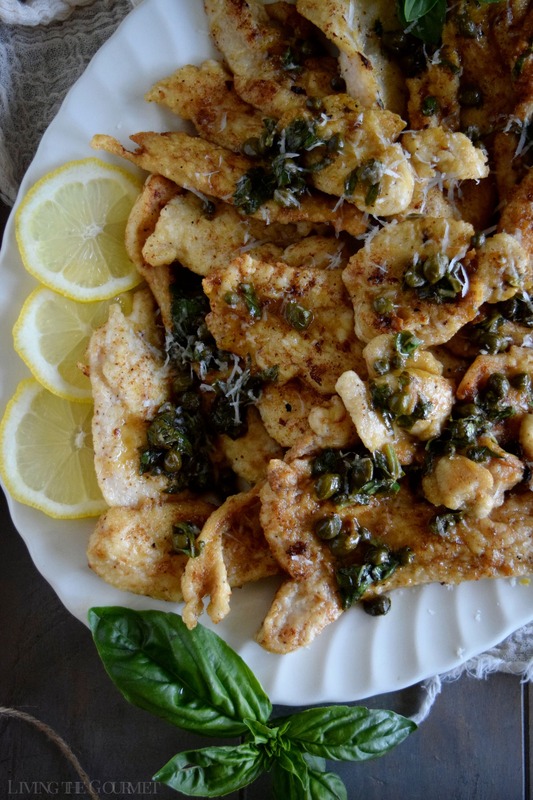 I love making such baked dishes with artichokes and capers so I know I'm gonna try this soon. Sounds so yum. This recipe has our name written all over it. Everything we truly love -- you've included. 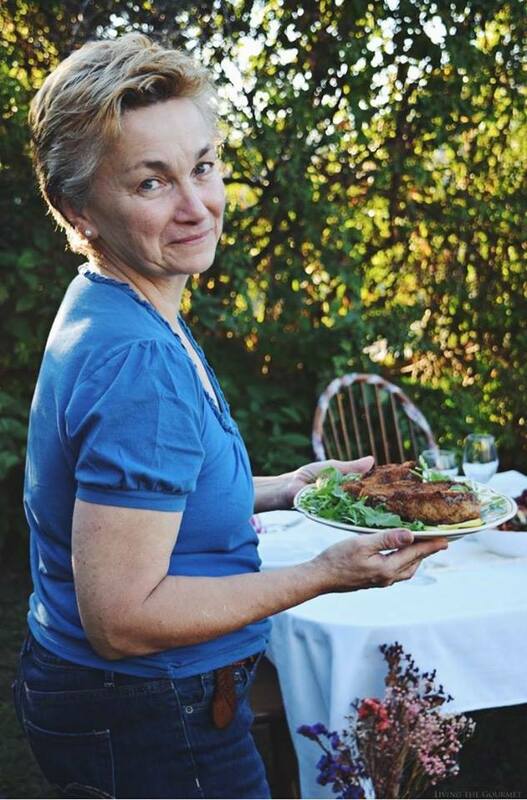 I grew up on polenta and when Hubby and I were first married polenta was hard to find. Now we frequently enjoy it and the extra we freeze. I've already pinned the recipe. Wow this sounds really delicious. 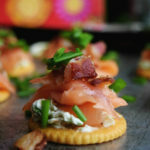 I love all the flavors and I know my family would love this too so I'm saving this recipe to try. YES to stepping outside our comfort zone! And if it involves this amazing meal, then I'll step out gladly! I've never eaten polenta, but this looks like a delicious place to start! 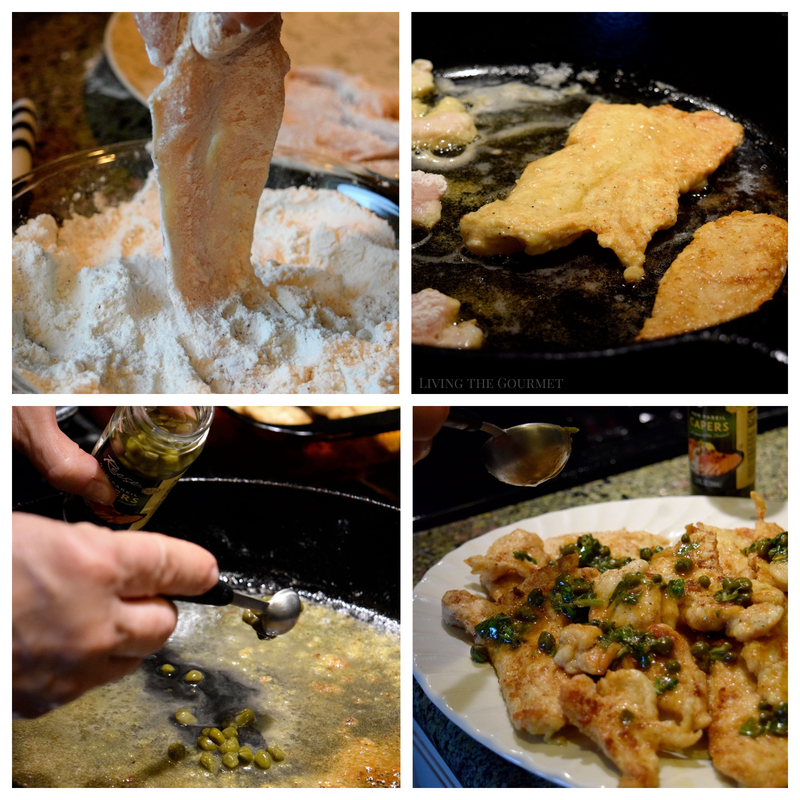 You had me at chicken, artichoke hearts, capers and polenta. YUM! Bookmarking this for sure. I love the sound of this, polenta is one of my favourite foods, so yummy!